If you strain yogurt, or cottage cheese – the liquid that is collected is called whey, it’s a byproduct of making cheese. Have you ever heard of whey protein? – Well this is it. Whey is made into a nutritional supplement. It is a nutritional powerhouse. A cup of whey has 25% of daily allowance of calcium – most of the calcium that’s drained from milk, it is also a good source of Thiamin, Vitamin B12, Pantheistic Acid, Magnesium, Potassium, Zinc and Selenium, and a very good source of Riboflavin and Phosphorus. In fact a lot of athletes drink whey, as a thirst quencher, because it contains a lot of potassium. My mother in law, always has a bottle of whey in the fridge, and often drinks it cold first thing in the morning, she swears it helps with digestion. I can’t drink it straight, but do add it to smoothies and vegetable juice as a boost in nutrition, especially during hot summer days for electrolytes. The flavor is acidic, like in buttermilk. I personally am not a fan. Whey is great in baking. First of all it adds nutrition to whatever it is you’re baking, you can substitute it for water or milk, and because it’s acidic – it reacts with perfectly with soda to produce the leavening, to produce a very light and fluffy product. I use it for pancakes and muffins. 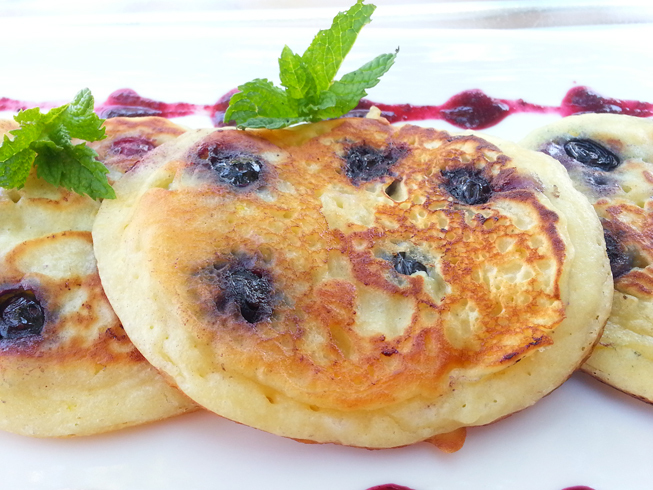 The following recipe is adapted from Whey Pancakes recipe from one on “King Arthur’s Flour” website. 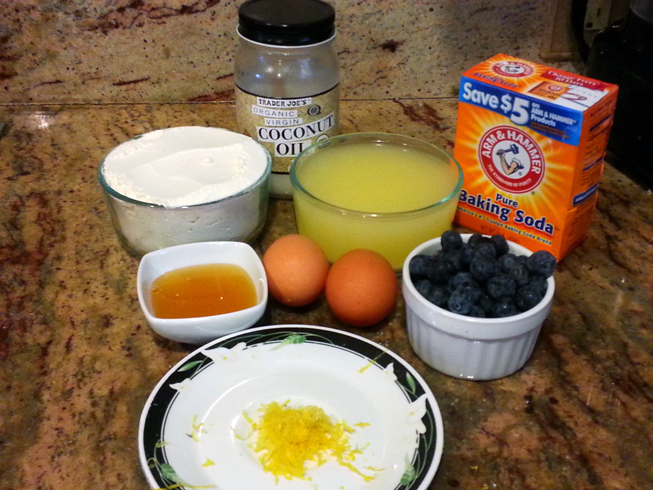 1 cup blueberries (fresh or frozen), I used frozen wild blueberries for the syrup, for their tang and nutritional value. 2 tablespoons either honey, sugar, agave syrup, etc. 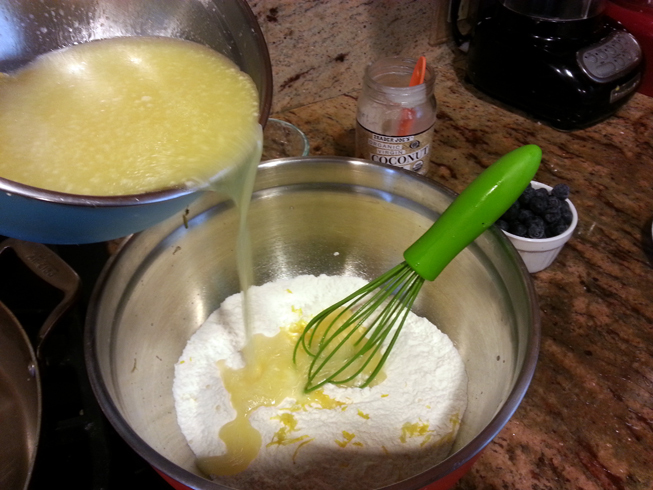 Mix the dry ingredients together in a mixing bowl(including the lemon zest). In another bowl, beat together the whey, eggs and vegetable oil. Blend the liquid ingredients with the dry . Don’t over mix. Give just enough quick strokes to moisten the ingredients. The less you mix- the lighter the results. Let the dough rest for 20 minutes. Heat the griddle. Test the temperature by letting a few drops of cold water fall on your griddle. If the waters sputters and fizzles – the heat is just right. Start adding pancakes to the pan. To ensure a round shape, pour the batter from the tip of the spoon or ladle. 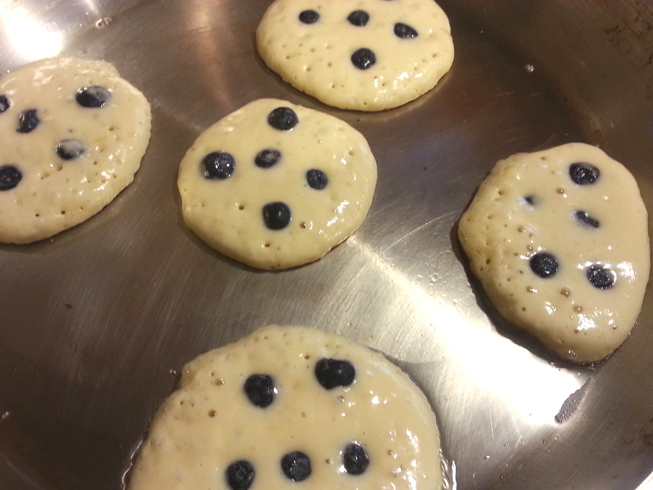 Add blueberries to the pancakes on the pan, otherwise they will release the juice and thin out your batter. Turn pancakes over only once. When bubbles on the surface of the pancake begin to break lift up an edge of the pancake with a spatula to check if the side has browned. If it has – turn over. To keep pancakes warm before serving, preheat oven to 200F or on the “Warm” setting. As you finish each batch add it to the plate and put it into the oven until you’re finished frying. Add blueberries, water and honey/sweetener of your choice into a saucepan and heat on medium high heat until it starts to boil. Add blueberry mixture into a blender and puree. Add pureed mixture into a strainer to remove skin and seeds. I am so making those! Can’t wait to try them out, I am sure my whole family will love ’em! Thank you! These are just beautiful masterpiece!